Everyone faces challenges, and some challenges require more cash than you have readily available. If you find yourself in that position, you might eye your 401(k) balance and consider using those funds to meet your present needs. That’s a natural response, but it’s usually not a good idea. If you are younger than age 59½, you generally cannot withdraw funds from your employer’s retirement plan while you are still employed, unless you qualify for a hardship distribution (explained later). If you are older than 59½, some plans may allow an in-service distribution. Even if you are eligible, all distributions from a traditional 401(k) are subject to ordinary income tax, and a 10% federal income tax penalty generally applies to withdrawals before age 59½. If you are in the 22% federal income tax bracket, a $10,000 withdrawal might put less than $6,800 in your pocket ($10,000 minus $1,000 penalty, $2,200 federal income tax, and any state income tax). 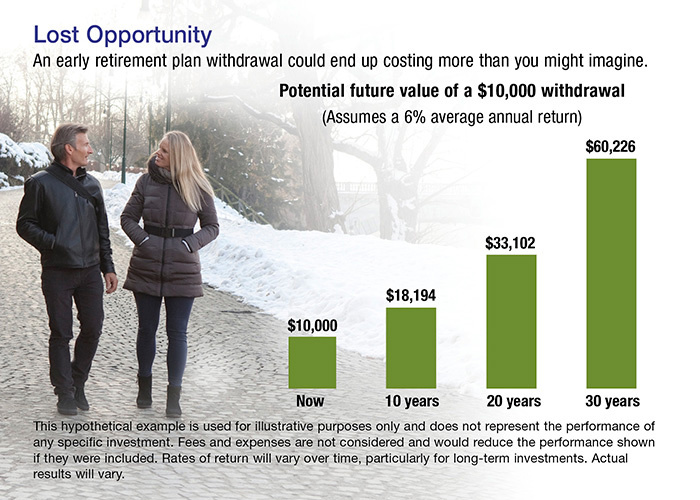 That’s a significant deterrent in itself, but the greater penalty could be the loss of future savings growth needed for retirement (see chart). If you really need to tap your 401(k) funds, a loan might be a better option, as long as loans are allowed by your plan and you anticipate staying with your employer long enough to pay the loan back. Under IRS rules, loans are limited to the lesser of $50,000 or 50% of the vested account balance. Loans must be repaid within five years (longer terms may be allowed for a home purchase). However, each plan is allowed to set its own interest rates and repayment policies. The good news is that even though the plan is required to charge interest, the interest is paid back to your own account. Of course, borrowed money isn’t pursuing investment returns, so your retirement savings goals may be interrupted as long as the loan is outstanding. If you leave your employer, you have until October of the following year (the federal income tax extension deadline) to put the borrowed money back into the old plan, a new employer plan, or an IRA. Failing to repay on time means the outstanding balance may be treated as a distribution and subject to ordinary income tax and the 10% early-withdrawal penalty. Keep in mind that, as with other withdrawals, a hardship distribution is subject to ordinary income tax and a potential early-withdrawal penalty. Securities offered through LPL Financial, Member FINRA & SIPC. Investment advice offered through Stratos Wealth Partners, a registered investment advisor and separate entity from LPL Financial. The LPL Financial Registered Representatives associated with this site may only discuss and/or transact securities business with residents of the following states: OH, FL, IL, PA, SC and TX.